Wilson Cruz and Anthony Rapp. Screenshot via CBS News. 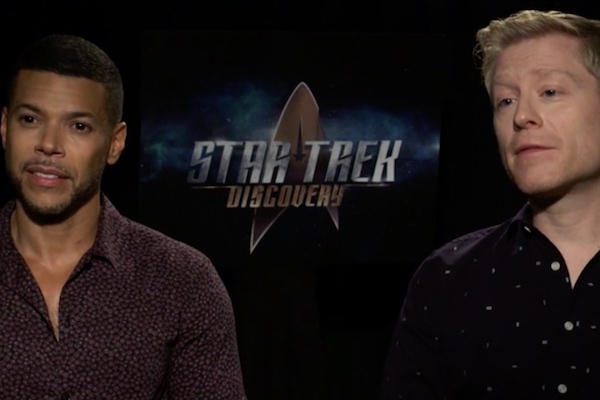 Wilson Cruz and Anthony Rapp will portray the first gay couple onboard ship in the “Star Trek” franchise on Star Trek: Discovery. Cruz will play medical officer Dr. Hugh Culber and Rapp will be starfleet officer Lt. Paul Stamets. The stars told CBS News that their relationship will be full of firsts for the series. A gay relationship will be monumental for the show, but Rapp says it won’t be the only focus. “The storyline affects our relationship, and the relationship may affect some decisions that are made, but the fact that it’s two men in a relationship is not the focal point of any storyline,” Rapp says. Cruz added that navigating work with an onboard relationship will prove challenging for the couple. Star Trek: Discovery premieres on tonight, Sept. 24 at 8:30 p.m. on CBS. The rest of the season will stream on CBS All Access.